Matter - Electricity Does It! Chapter 1: Matter - Electricity Does It! A black night-no moon and a few stars here and there. Gun crews are alerted by enemy aircraft. Guns are pointed, trained, and fired. How are those guns pointed and trained? By hand? No! Sighting is impossible. The guns are entirely on Director Control. All of this work-locating the target, training and pointing, and even firing-is done by ELECTRICITY. Some ships are propelled by electricity. Hoists, winches, and cranes are powered by electricity. Radio, radar, and telephones all depend on electricity. Electricity is the most important single force used in the modern Navy. You are going to use electricity in your rate. Your first question is, "WHAT IS ELECTRICITY?" Even the world's greatest scientists don't know the answer to that one. They have made shrewd guesses and have developed theories. Present indications tend to show that these theories are pretty much correct. At any rate, the basic ideas will help you to understand how electricity acts. And remember, you must UNDERSTAND before you can CONTROL. Electricity, out of control, can kill both men and ships. Have you ever considered how practically every-thing around you OCCUPIES SPACE and HAS WEIGHT? The scientist calls these things MATTER. All matter is composed of tiny particles called MOLECULES. Molecules are composed of ATOMS; and atoms are composed of ELECTRONS and PRO-TONS. These electrons and protons are ELECTRICITY. Let's see what all this means. If you crushed a common brick, you would get a pile of small grains of sand and clay. These grains are matter just as the whole brick was matter. According to the scientists, you have not made any changes in this matter. The sand and clay could be remolded and baked. You would again have a brick. Now, if you COULD break down one grain of sand into its smallest parts (without destroying the sand), you would have billions upon billions of MOLECULES. Molecules are almost unbelievably small. It would take 300,000,000 molecules laid end to end 'to make a line one inch long. The molecule is the smallest particle of any piece of matter that can exist and STILL BE THE SAME KIND OF MATTER. As small as the molecule is, it is NOT the smallest particle of matter. Every molecule can be broken down into two or more smaller particles called ATOMS. But you would NO LONGER have the same kind of matter. Two DIFFERENT substances are obtained from the break-up of the sand molecule a gas (oxygen) and a solid (silica). These are ELEMENTs - the building materials of matter. The smallest particle of each of the different elements (and there are only 92 different elements) is an ATOM. Thus you obtained ATOMS of oxygen and ATOMS of silica from a MOLECULE of sand. You can reverse the "tearing down" process to one of "building up "- two or more atoms are combined to form a molecule. Molecules of steel, copper, water, rubber, paint, oil, -in fact, ALL SUBSTANCES - are simply combinations of two or more atoms. You are probably wondering how much farther you go until you get to electricity. You are near the end-only one more transformation-BUT it takes an atom-smasher to do the job. This machine, by using tremendous amounts of electricity, can literally smash an atom into its smallest parts-the PROTON and the ELECTRON. These tiny bits of matter are the smallest particles scientists have been able to isolate. You know that molecules are small. But remember that each molecule has TWO OR MORE atoms and most atoms have MANY protons and electrons. It would take many millions times as many electrons and protons as there are people in the world to make one grain of sand., Protons are about 2,000 times heavier than electrons and considerably larger. Each proton and each electron carries a charge of electricity. In order to distinguish between the two kinds of charges, the electron is said to have a NEGATIVE charge and the proton a POSIIVE charge. It is easier to understand how a ship. is constructed if you work in a shipyard. You see the keel laid, frames set in place, stanchions erected, and the decks laid. Then, during outfitting, you see the wiring installed, tackle and gear set in place, and the guns swung aboard. In short, you see the ship constructed from its smallest parts. It would probably be easier to understand how a piece of matter is constructed if you could see it built. But, unfortunately, there is no microscope powerful enough to permit you to see electrons, protons, atoms, or even molecules of matter. Figure 1. - The hydrogen atom. However, suppose you do a little imaginary enlarging-you have increased the sizes of electrons and protons until each electron is represented by a small white marble, and each proton is represented by a somewhat larger black marble. Now - you are going to construct enough water to fill a drinking glass. You will need billions of small white marbles (electrons) and exactly the same number of larger black marbles (protons). Anything else for ingredients? No! All matter - water, steel, brick, gunpowder, air, and even YOU - is made only of ELECTRONS and PROTONS. Water consists of two atoms of the element hydrogen and one atom of the element oxygen. You'd build the hydrogen atom first as it contains only one proton and one electron. You anchor one proton (black marble) to form the center, or stationary nucleus, of your hydrogen atom. Then you spin an electron (white marble) around this nucleus. You have one atom of hydrogen! It would look like figure 1. Second, you must build another hydrogen atom, because each molecule of water contains two hydrogen atoms. Figure 2. - The oxygen atom. Figure 3. - A molecule of water. Figure 4. - Electricity and matter. Third, it is necessary to build the oxygen atom. 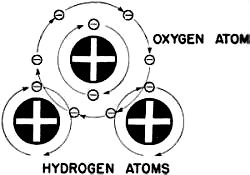 The oxygen atom ,is more complicated than the hydrogen atom. In fact, atoms of all of the other 91 elements are more complicated than the hydrogen atom. However, the oxygen atom - LIKE ALL ATOMs - contains only electrons and protons (RF Cafe note: The author dismisses neutrons in the nucleus). For an oxygen atom, sixteen protons and eight electrons are secured together to form the nucleus and eight additional electrons are whirled around this nucleus in the ORBITS, as shown in figure 2. Now you have all the atoms necessary to make ONE molecule of water. Forming a molecule of water is the next task. You could mix hydrogen and oxygen atoms together until you were blue in the face and still you woul4 not have water. BUT introduce a spark and -if the resulting explosion doesn't blow your head off-you would discover that you had produced water. The explosion was the COMBINING of oxygen and hydrogen atoms to produce water. Of course, you would have to produce billions and billions of molecules of water to get a glass full. A water molecule is shown-diagrammatically in figure 3. Perhaps you remember the German dirigible Hindenburg. This was a hydrogen-filled ship. Some of 'the hydrogen leaked from its tanks and mixed with the oxygen of the air. A spark set off this mixture as the ship landed at Lakehurst. 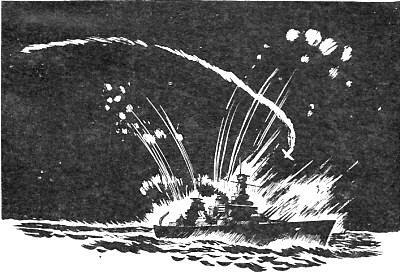 The resulting explosion formed quite a bit of water and, incidentally, killed most of the crew. You now have a pretty good idea of the structure of water. Water, however, is only one kind of matter. Other kinds, steel, wood, air, cloth, and food, are built up the same way. Protons and electrons combine to form atoms of the 92 elements. 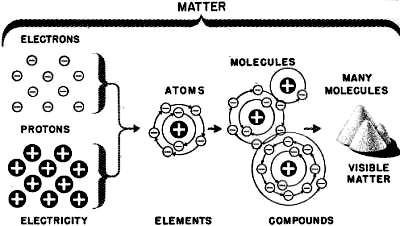 The atoms combine to form molecules. And molecules-pack together until they form a bit of matter large enough to see. Remember, if you break any-thing down _to the smallest possible part, you will have positive bits of electricity - the PROTONS - and negative bits of electricity - the ELECTRONS. A little study of the chart in figure 4 will help you to remember these units of matter.